MenEngage Africa (2015). 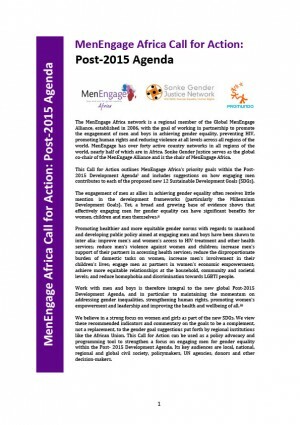 MenEngage Africa Call for Action: Post-2015 Agenda. MenEngage Africa, Sonke Gender Justice, Promundo. This Call for Action outlines MenEngage Africa’s priority goals within the Post-2015 Development Agenda and includes suggestions on how engaging men contributes to each of the proposed new 12 Sustainable Development Goals (SDGs). The engagement of men as allies in achieving gender equality often receives little mention in the development frameworks (particularly the Millennium Development Goals). Yet, a broad and growing base of evidence shows that effectively engaging men for gender equality can have significant benefits for women, children and men themselves. Promoting healthier and more equitable gender norms with regards to manhood and developing public policy aimed at engaging men and boys have been shown to inter alia: improve men’s and women’s access to HIV treatment and other health services; reduce men’s violence against women and children; increase men’s support of their partners in accessing health services; reduce the disproportionate burden of domestic tasks on women; increase men’s involvement in their children’s lives; engage men as partners in women’s economic empowerment; achieve more equitable relationships at the household, community and societal levels; and reduce homophobia and discrimination towards LGBTI people. Work with men and boys is therefore integral to the new global Post-2015 Development Agenda, and in particular to maintaining the momentum on addressing gender inequalities, strengthening human rights, promoting women’s empowerment and leadership and improving the health and wellbeing of all. We believe in a strong focus on women and girls as part of the new SDGs. We view these recommended indicators and commentary on the goals to be a complement, not a replacement, to the gender goal suggestions put forth by regional institutions like the African Union. This Call for Action can be used as a policy advocacy and programming tool to strengthen a focus on engaging men for gender equality within the Post-2015 Development Agenda. Its key audiences are local, national, regional and global civil society, policymakers, UN agencies, donors and other decision-makers.